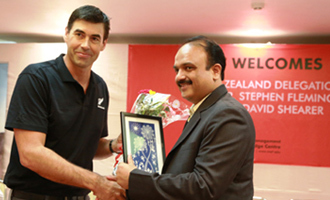 A high profile delegation from New Zealand led by successful cricketer and former New Zealand captain Mr. Stephen Fleming who is currently also coaching the IPL Chennai Super Kings, visited MET on 16th April 2015. He and the delegation were felicitated by Mr. Pankaj Bhujbal, Trustee, MET. Mr. Stephen Fleming mesmerized the students with his engaging speech.